We haven't seen a new GSM BlackBerry from RIM since November last year when the Curve 8900 was announced. So, the new BlackBerry Curve 8520 is a long overdue new addition to their range. This is a very disappointing handset. In most major ways it is unchanged from the old 8300 series. The biggest problem is that the 8520 doesn't support 3G, although it does have WiFi in addition to quad-band GSM. Another disappointing feature is the camera, which is a basic 2 megapixel unit. We will admit that the old Curve is a phone we liked a lot, and although the 8520 does improve on it in a variety of ways when it comes to software and hardware, we really just get the impression that the 8520 is just the same old thing repackaged. One notable change is that the 8520 no longer has a trackball, but it comes with a tiny touchpad instead. We think that this will probably be a useful improvement, although perhaps many consumers would expect a touchscreen these days. There seem to be more keyboard shortcuts than ever before, and the 8520's mail client can cope with a wide variety of email protocols, including most popular webmail services. Audio playback is pretty comprehensive, and the BlackBerry 8520 has a standard 3.5mm audio socket as well as stereo Bluetooth. This phone also supports most major video formats. 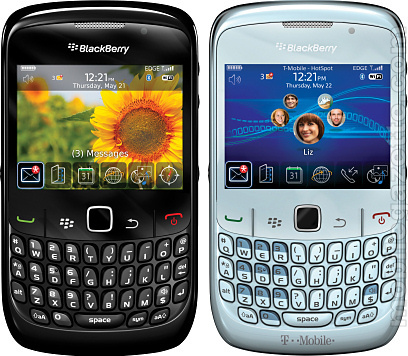 The BlackBerry Curve 8520 can also work with Microsoft Office documents and most other common file types. It also supports instant messaging and has applications to allow it to upload to Facebook and Flickr. Of course, because this is a BlackBerry then it also has an excellent range of personal information management tools. It's a Mac-compatible device too which should appeal to a large number of home users. But we are halfway through 2009, and really we don't expect to see a relatively high-end media device like this without 3G support. RIM could get away with having GSM-only smartphones back in the days when BlackBerry devices were only used for corporate email. But competition in the corporate sector is intense, especially from Microsoft. As a result of this competition, RIM devices have been aimed more at consumers.. but these consumers will want to be able to access the web from anywhere they go, and GSM just doesn't cut it these days. And since every other manufacturer now makes BlackBerryesque messaging phones, then the competition is hotting up here too. So the problem with the BlackBerry Curve 8520 is that it already seems out of date. Yes, it's a well polished device, but the fundamental hardware specification is something that we might have accepted two years ago, but not now. We understand that RIM have some other more interesting BlackBerry handhelds in the works too, so hopefully they can come up with something better than this. RIM say that the BlackBerry Curve 8520 should be available in Europe from August on a variety of carrier networks and in the US exclusively on T-Mobile. No guidance was given on price, although we would expect it to be something in the €250-€300 range SIM-free.